This corn on the cob topping is olive oil-based instead of butter-based. 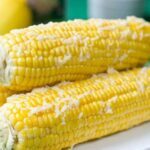 It’s a mixture of olive oil, Parmesan cheese and lemon juice that dribbles down your chin when you bite into the corn. 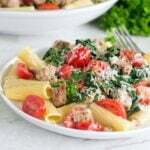 This recipe is sponsored by Pompeian in honor of National Olive Oil Month. Get all my delicious recipes that feature olive oil here. It’s hard to imagine that corn on the cob originated as something smaller than our thumbs, smaller even than baby corn, actually. 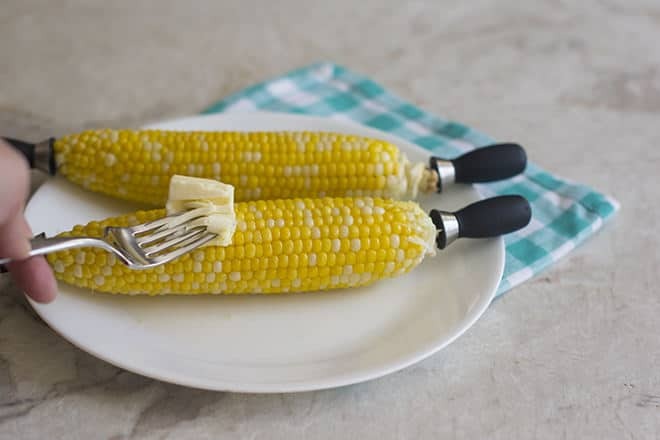 There wouldn’t have been enough to enjoy on each cob. I would’ve had to have four. Or five. Or fifteen. To be honest, even with today’s big cobs of corn I’m often tempted to have several. That’s probably a genetic thing since my mom tells us that when she was growing up, when the corn crop came in, they would feast on corn for dinner. Just corn. Nothing else. Except for a lot of butter and salt. Which brings me to today’s recipe. It’s for corn on the cob. But without butter. Instead, the topping is a mixture of olive oil, Parmesan cheese, and lemon juice. 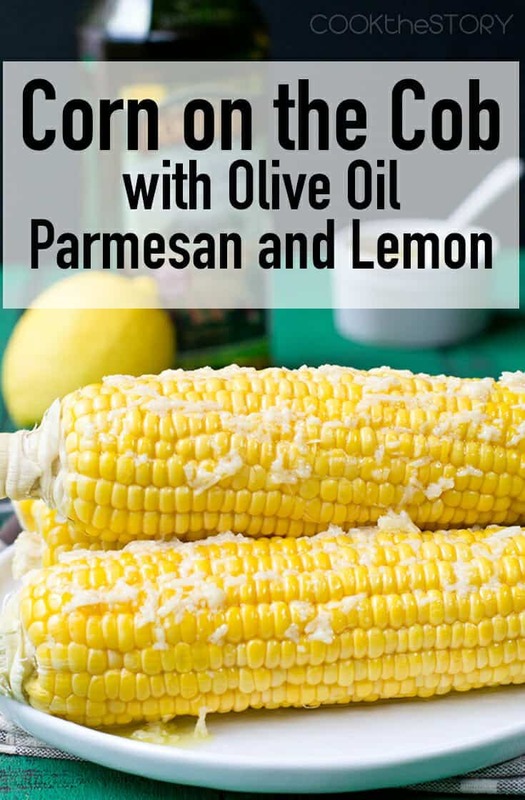 If you put it on hot cobs of corn, the parmesan melts and clings while the olive oil and lemon dribble. If you want to do some olive oil dribbling along with me, check out this handy butter-to-olive-oil conversion chart. 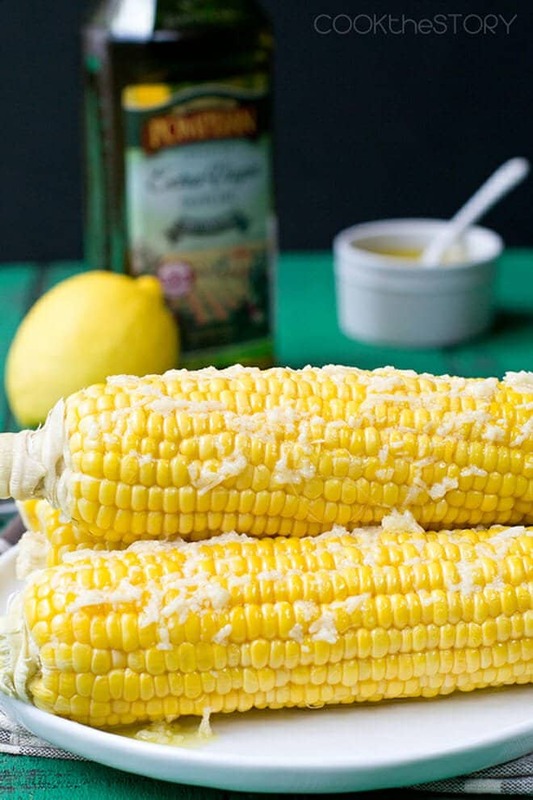 And now, here’s my recipe for Corn on the Cob with Olive Oil, Lemon and Parmesan. This corn on the cob topping is olive oil-based instead of butter-based. 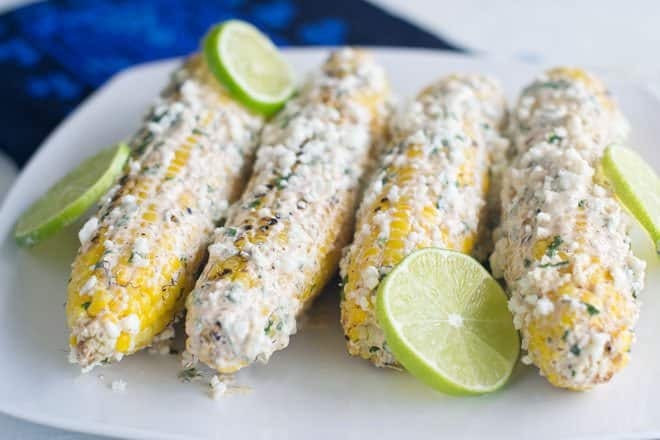 It’s a mixture of olive oil, Parmesan cheese and lemon juice that dribbles down your chin when you bite into the corn. In a small bowl use a fork to combine and mash together the parmesan cheese, olive oil and lemon juice and salt. Dribble it over the hot corn. Eat! 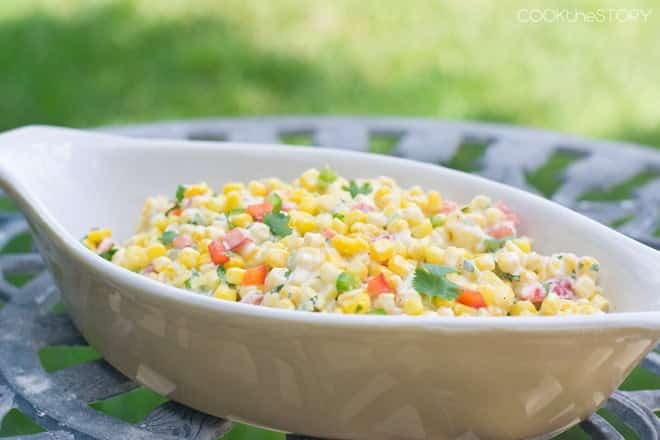 There are several ways that you can cook the corn for this recipe. My favorite is to bring a big pot of water to a boil and then add a handful of sugar. This adds extra sweetness to the corn. Stir until it dissolves. Then add the corn and simmer until done, about 5 minutes. But you can also grill it or steam it in the microwave – here’s my recipe. *The info about the size of original corn cobs and number of cobs per plant comes from Wikipedia. 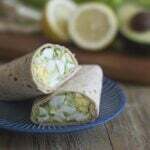 Disclosure: I’m a brand ambassador for Pompeian meaning that they compensate me to develop recipes and to promote their products on my blog and on social media. All opinions are my own. This post originally appeared in August, 2014 and was revised and republished in July 2018. This looks so delicious! I like the idea of leaving behind the butter and salt and doing something different! This sounds great!! 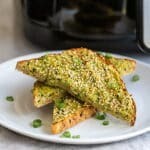 I usually just use butter on my corn but I am going to have to try this! Such a nice twist on a classic! 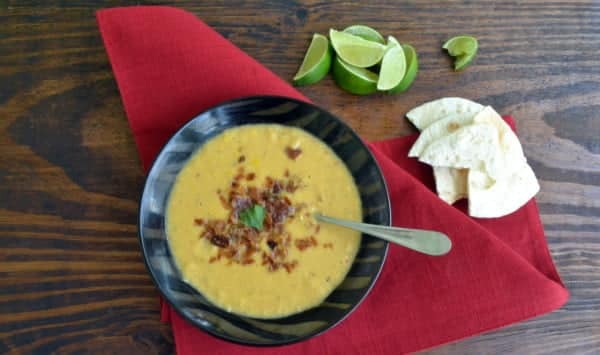 I have been so crazy for corn lately, this is really calling my name! That topping sounds delicious – I love the touch of lemon juice for balance. Corn on the cob is a total favorite. As a kid we loved it so much it would be the main course at dinner! This version you made looks AMAZING. I am realizing here that I have been a pretty boring corn on the cob eater. I am going to fix that pronto. Simple and delicious! Yay, I like it. YES!! Love this easy recipe. Corn on the cob is my favorite summertime treat but this puts it over the top! No butter here! This recipe is part of Pompeian’s pledge to swap out butter for olive oil. Olive oil is good on corn. You’ve gotta try it! Thanks for commenting and have a great day!